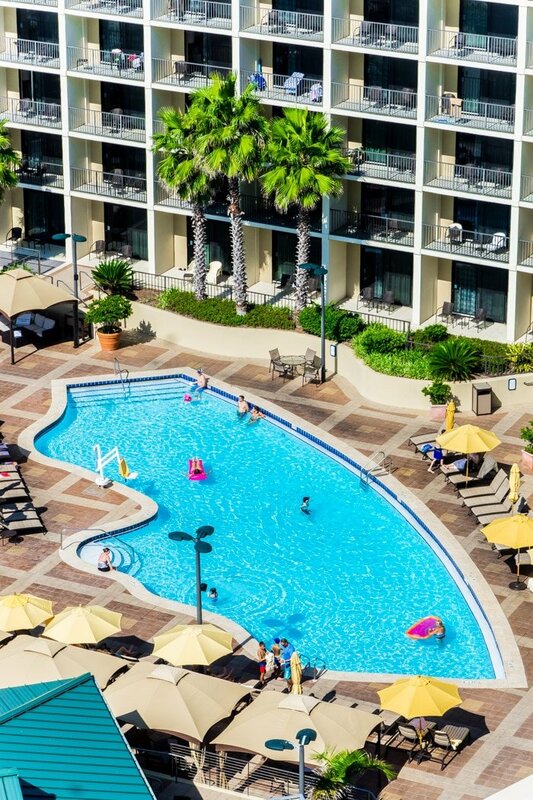 Find out why the Hilton Sandestin Beach Golf Resort & Spa in Sandestin, Florida is the perfect place to stay for a family vacation to Sandestin! 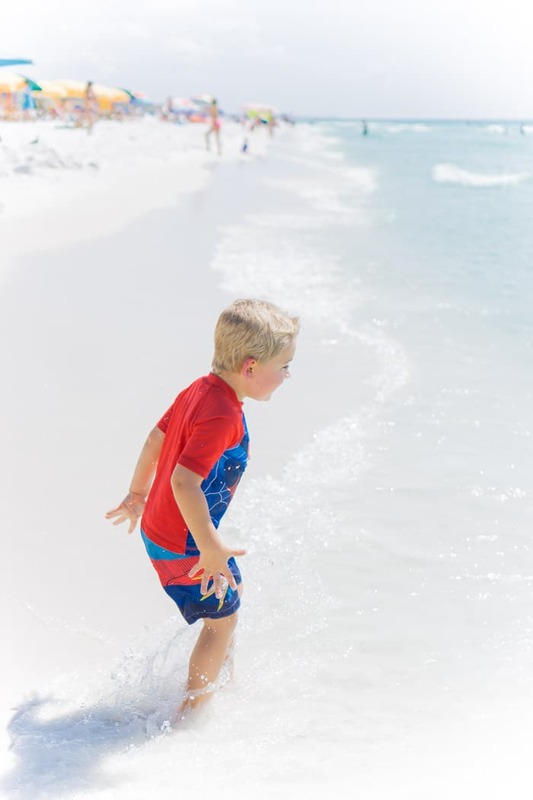 From beachfront access to family-friendly restaurants, the Hilton Sandestin Beach resort is a great option for families with young and old kids alike. 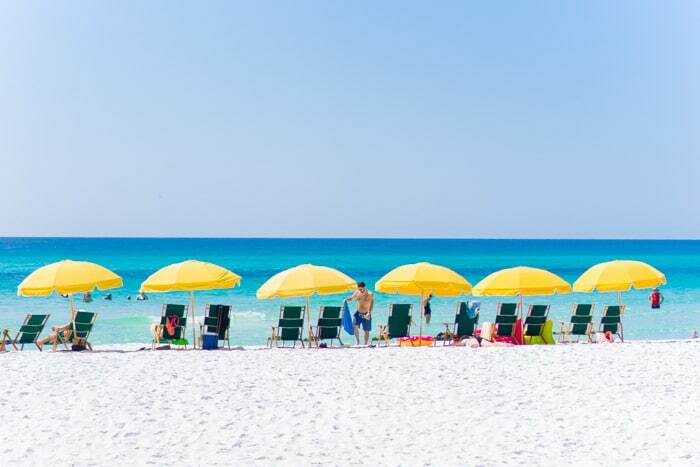 When I asked some of my friends if we should visit Sandestin, Florida, I receive an immediate resounding yes from everyone I asked. 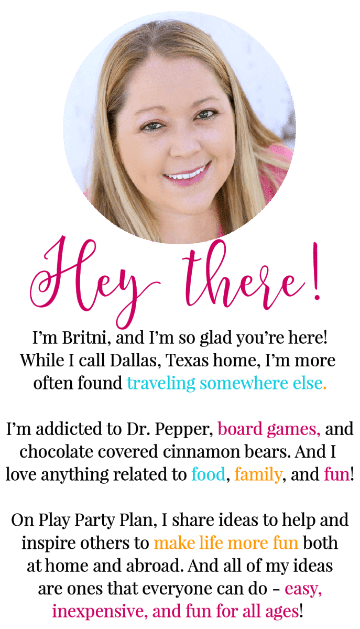 While we’d never been before, it is a popular family destination spot, especially for anyone living in the Southwestern states like Texas, Alabama, and Georgia. 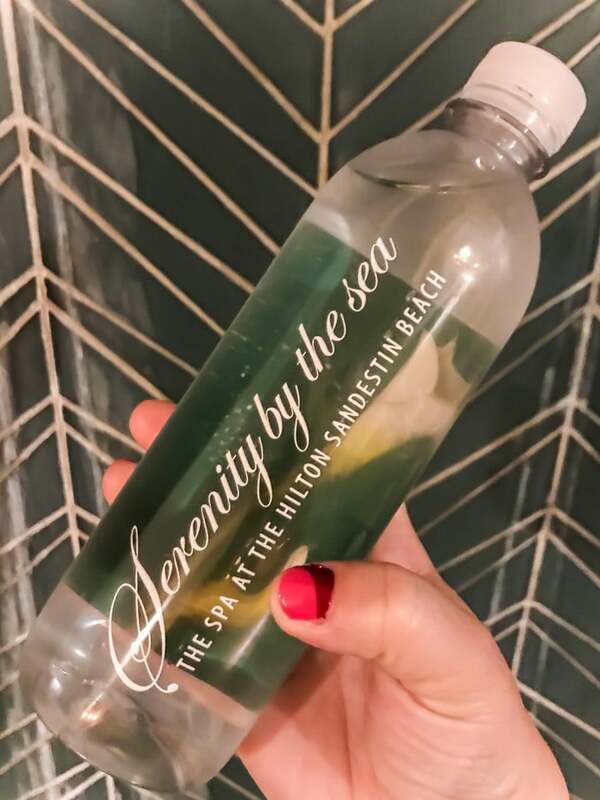 After our recent visit to the Hilton Sandestin Beach Golf Resort and Spa, I can see why. The beaches are gorgeous, the people are friendly, and the resorts sure know how to take care of families. 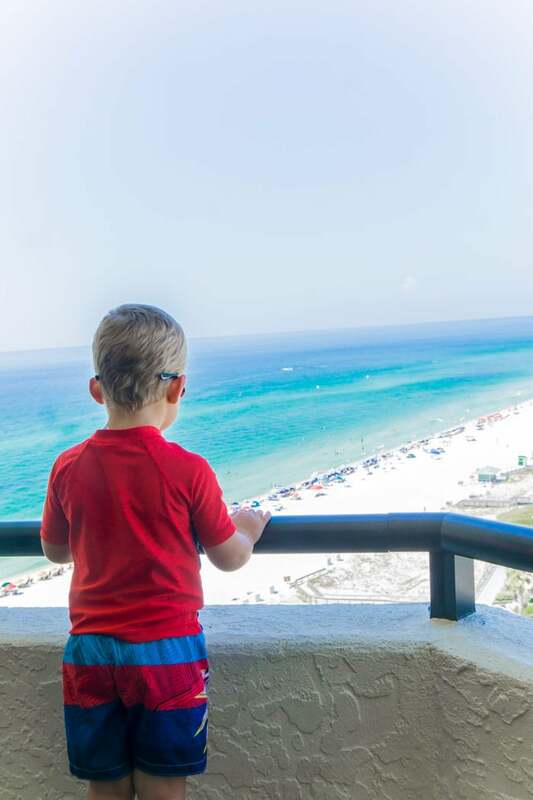 These are just some of the reasons the Hilton Sandestin Beach in particular is a fantastic destination spot for families whether you have young kids like me or older kids. We just visited for a quick three-night weekend trip and that weekend was enough to convince me that we need to plan a longer trip back soon. 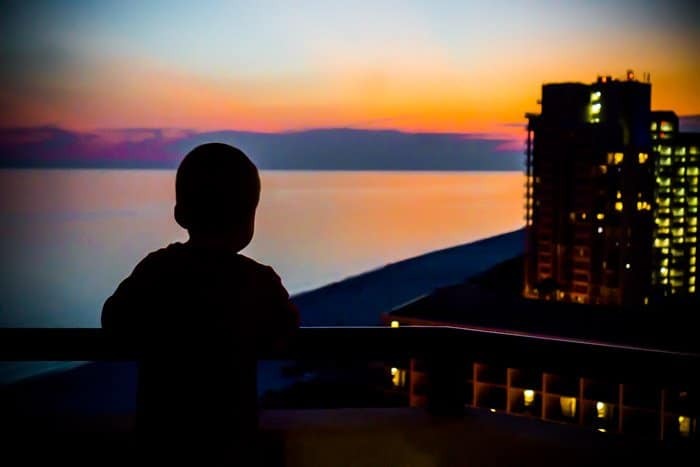 What Makes Hilton Sandestin Beach Family-Friendly? 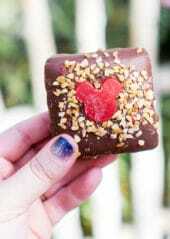 I’m a big foodie and so is my husband. When we choose resorts, we choose ones with not only various restaurant options but good ones. 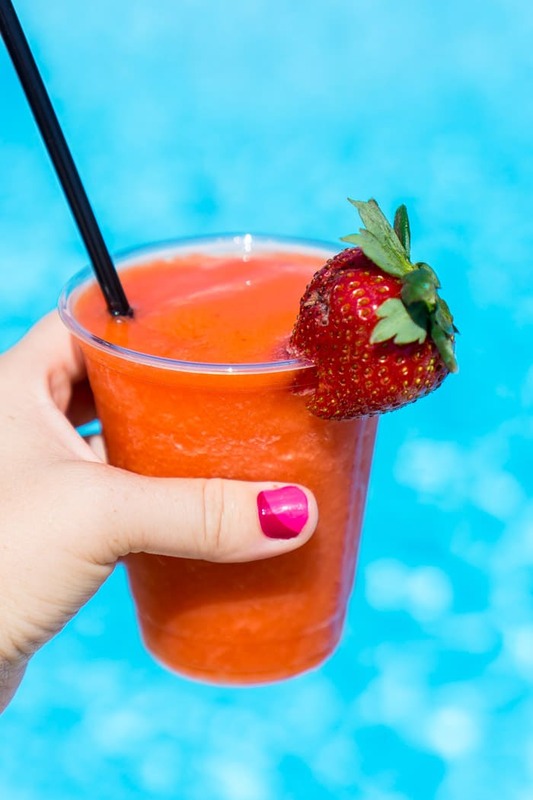 At the Hilton Sandestin Beach, you have nine different options for food and drinks, nine. 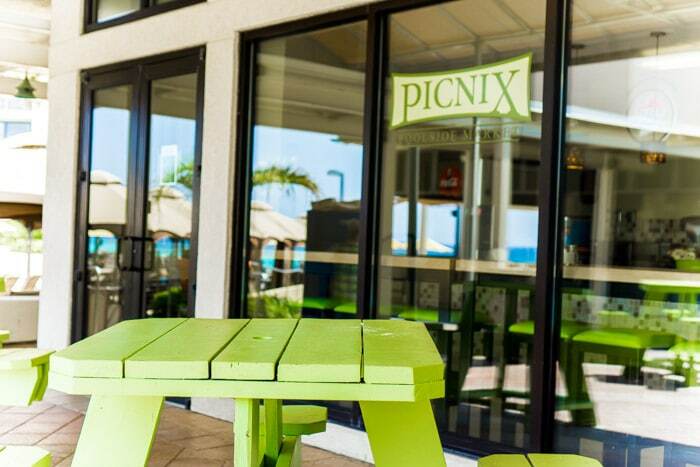 They offer everything from the gourmet and upscale Seagar’s Prime Steaks and Seafood to grab and go sandwiches and snacks at the more family-friendly Picnix Poolside Market. I even had one of the Barista’s at The Coffee Shop searching for Fruit Loops in her cabinets when my 4-year-old had a melt down because we didn’t save his from the breakfast buffet at Sandcastle’s. 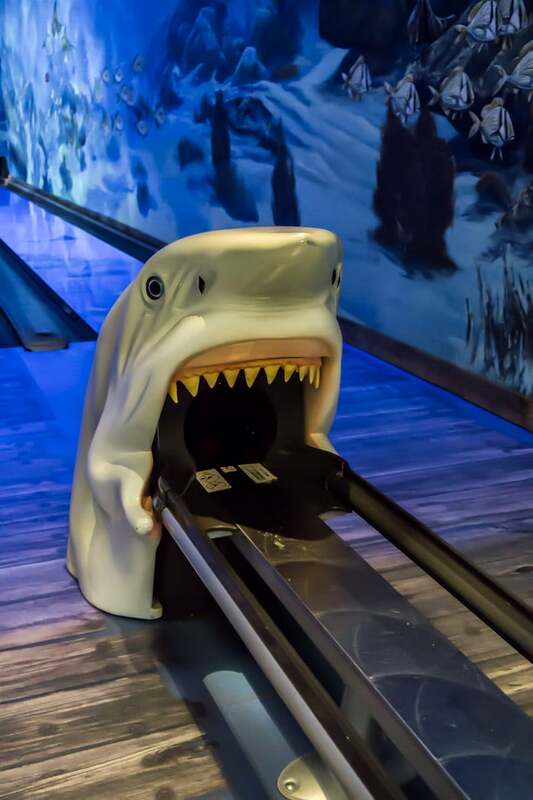 The best thing about the restaurants is that they really go out of their way to make them not only kid-friendly but also good for adults as well. 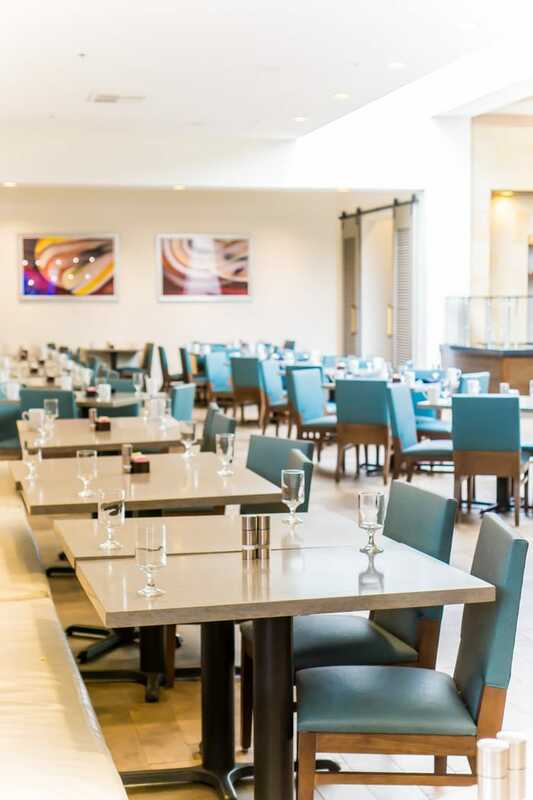 For example, the breakfast buffet not only has cinnamon rolls and crunchy bacon, they have a made to order omelet bar for adults who prefer their breakfast a little less sugary. Outside at the Barefoot’s Beachside Bar & Grill, my husband enjoyed a seared ahi tuna salad while my son and I split a quesadilla and french fries. And best of all, if you don’t actually want to leave the beach, you can actually order online and a server will bring your food to the beach to you on the beach. 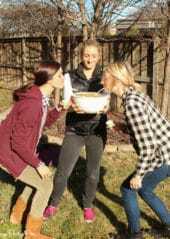 No need to make the kids stop playing the sand to go eat, eat and play at the same time! 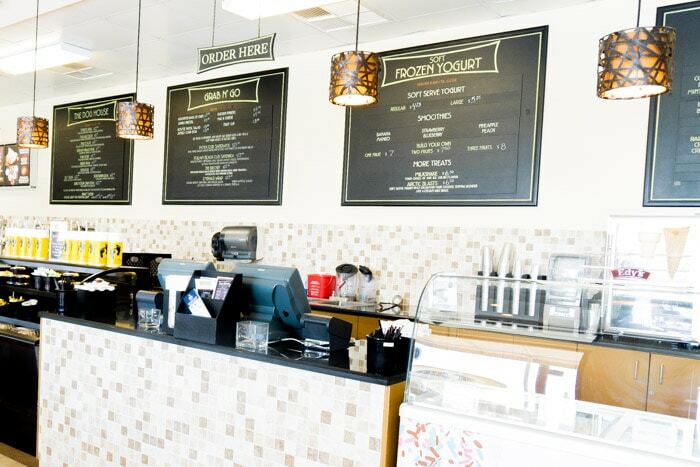 Unless you want to go out and try one of these places to eat in Destin, you don’t have to. 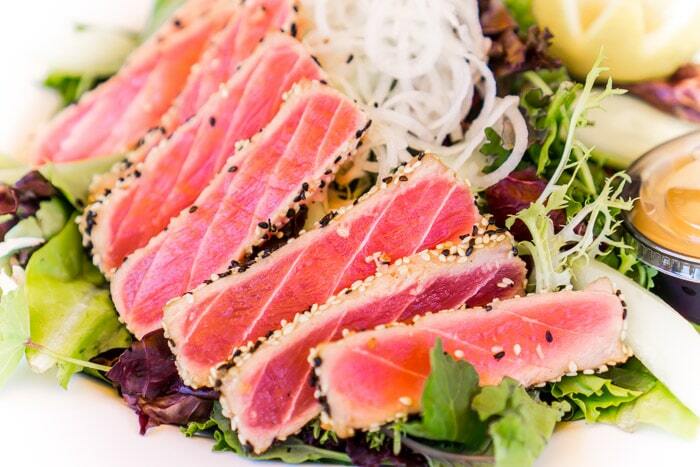 You really could eat at only the Hilton Sandestin Beach restaurants and never get sick of the food. 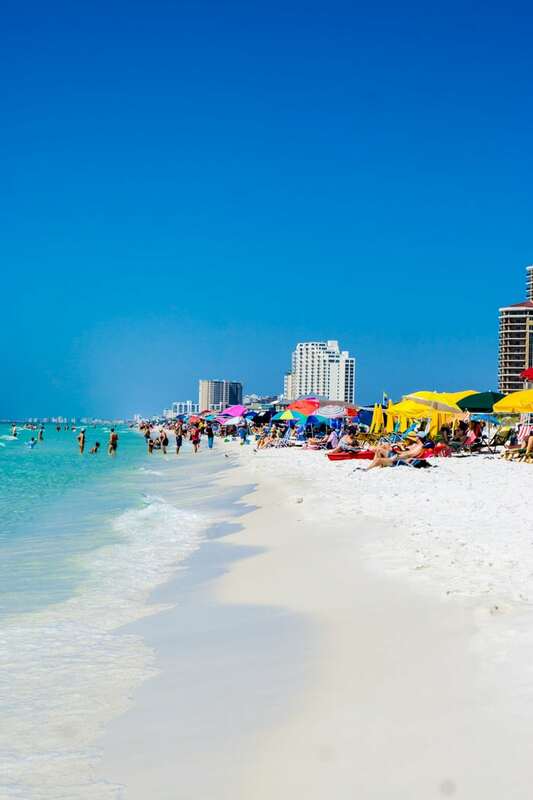 Speaking of the beach, one of the most popular reasons to visit Sandestin is the beach! 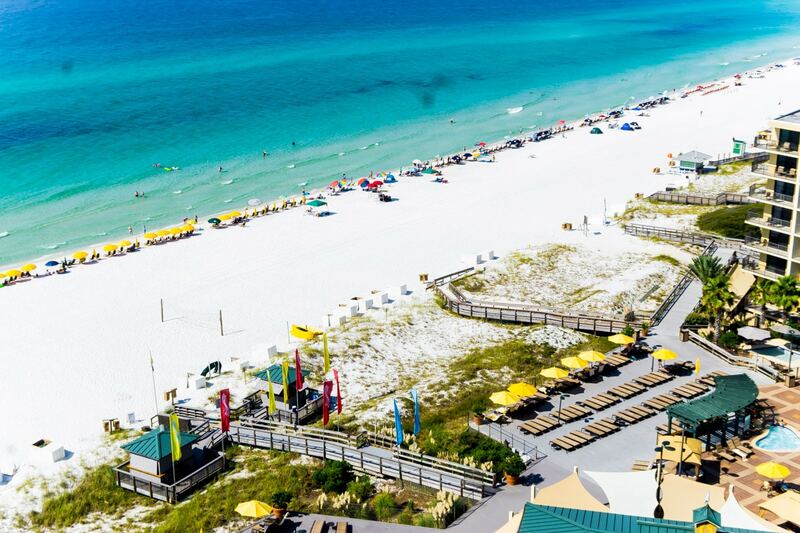 The Hilton Sandestin Beach is located directly on the beach so to access the white sand, all you have to do is go down an elevator, walk across a pool deck, and take off your shoes before enjoying the sand and sun. It was so nice to be able to just walk directly to the beach instead of having to get into a car and drive somewhere, especially when we wanted to just spend an hour there before after nap time. You’d never know that the beach directly in front of the Hilton Sandestin Beach wasn’t a private beach. 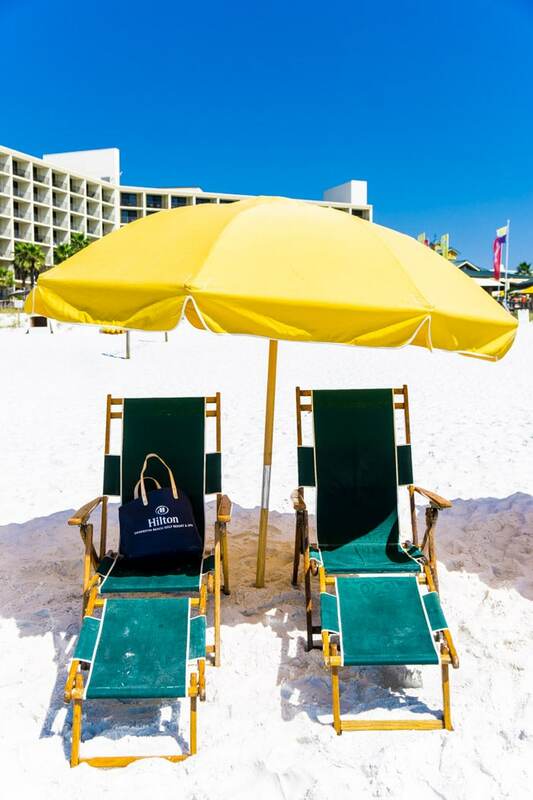 Yellow umbrellas and chairs line a section in front of the resort (available for rent!) that seemed to deter anyone other than hotel guests from using that stretch of sand. 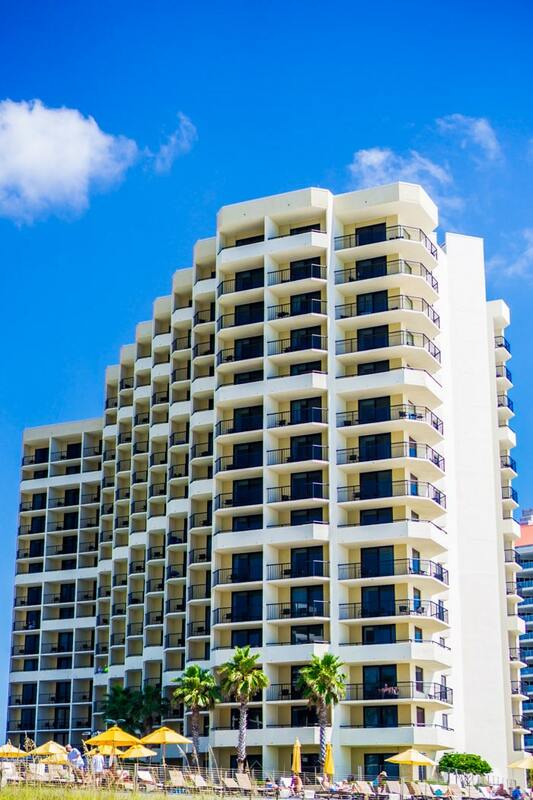 It’s the perfect place to enjoy a lazy day relaxing in a lounge chair with a good book, building sandcastles, or wading into the not too deep gulf waters. And when you’re done, walk the five minutes back up to your hotel room to freshen up before enjoying dinner at one of the resorts many restaurants. Sick of the beautiful beach? 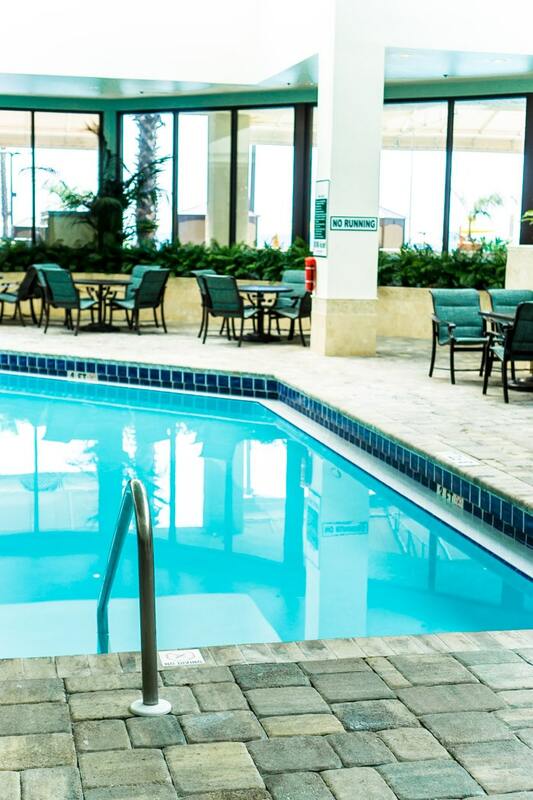 Take a dip as a family in one of the three large pools (two indoor + one outdoor) at the resort, or let the kids play in the smaller kiddie pool. All three are large enough that even though we were sharing them with other guests, they never felt overcrowded, probably because there were three, and a beach, to choose from. 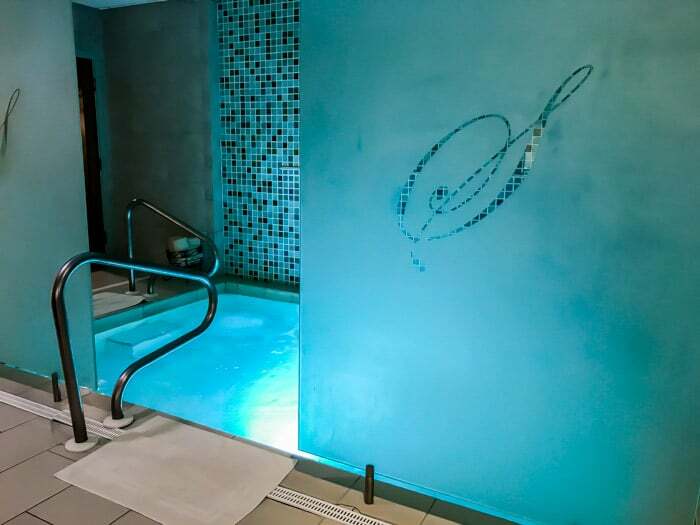 One of my favorite parts of our entire weekend was a morning spent at Serenity by the Day Spa. 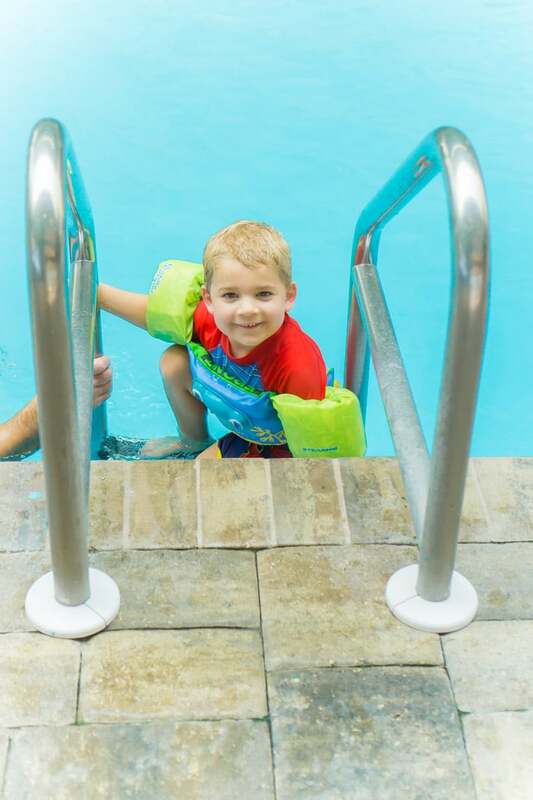 My husband took my son for a swim while I went and enjoyed a massage and the relaxing spa facilities. 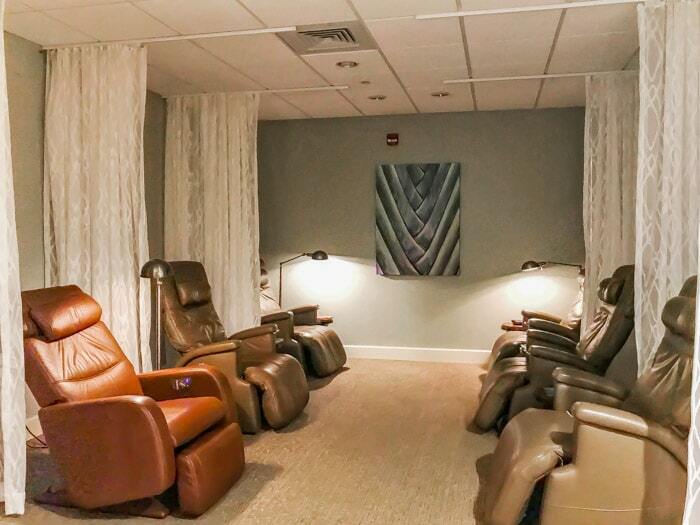 Anyone who receives a treatment can use any of the spas facilities including saunas, zero gravity chairs (amazing!! 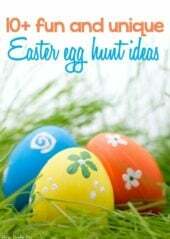 ), a hot tub, showers, healthy snacks, and more. It took all I had to actually leave the spa when my husband called and decided it was time for lunch. 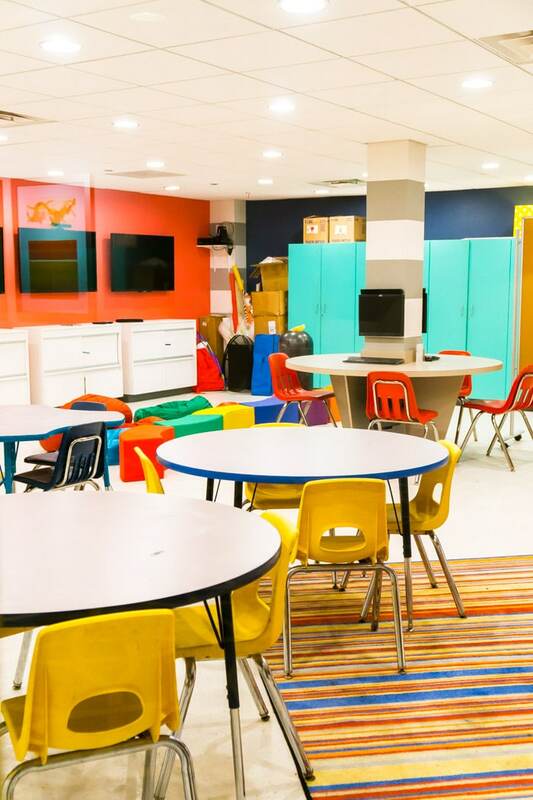 During the summer months, kids older than five can participate in the Kids Krew programs, which include both indoor and outdoor activities like kite-flying, slip & slides, and even themed days. 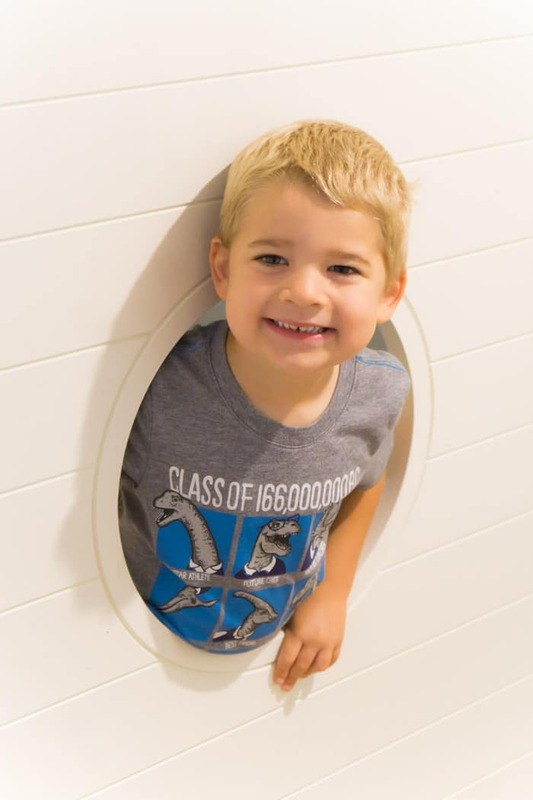 Pay the small additional fee to let your kids play with other kids their age in the Kids Krew Club and take a few minutes for yourself at the spa. 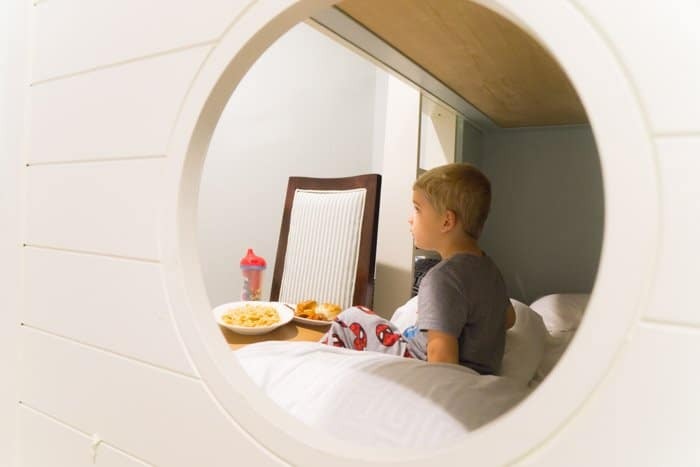 Families will love the family parlor suites that are set up with one bed by the window and a set of bunk beds, with their own TV, closer to the door, with a shared bathroom in the middle. Not only did having the bunk beds away from our bed allow my son to actually take a nap in the middle of the day, but he actually loved having his own space AND his own TV. We loved being able to relax in our own bed without having to watch yet another episode of Vampirina. The family parlor suites are a bit more expensive than some of these other room options, but in my opinion the splurge is totally worth it. 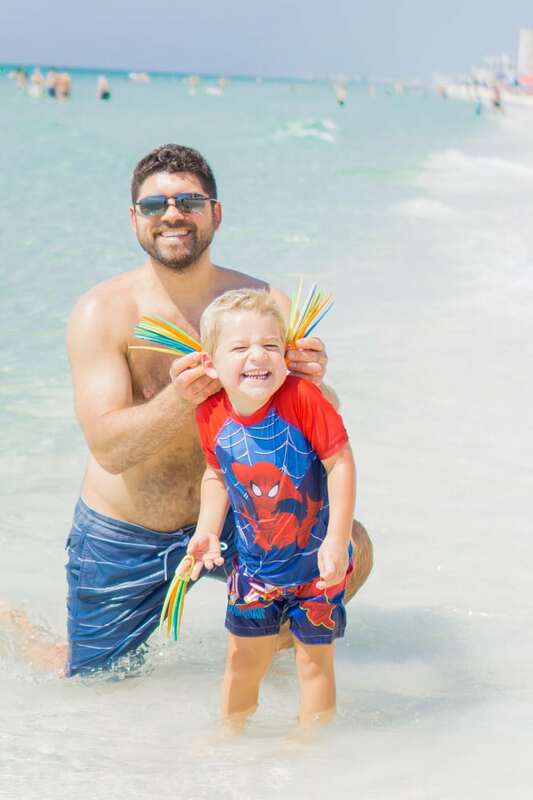 In addition to the beach and the pool and kids’ TVs in the rooms, the Hilton Sandestin Beach also had fun free activities around the resort that are great for kids. 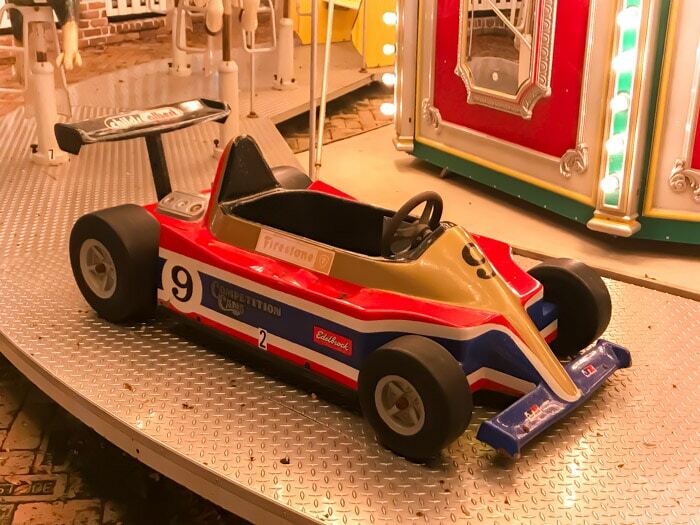 From ping pong tables to a massive Connect Four outdoor game and an outdoor volleyball court on the beach, there really was always something you could be doing without spending any additional money. 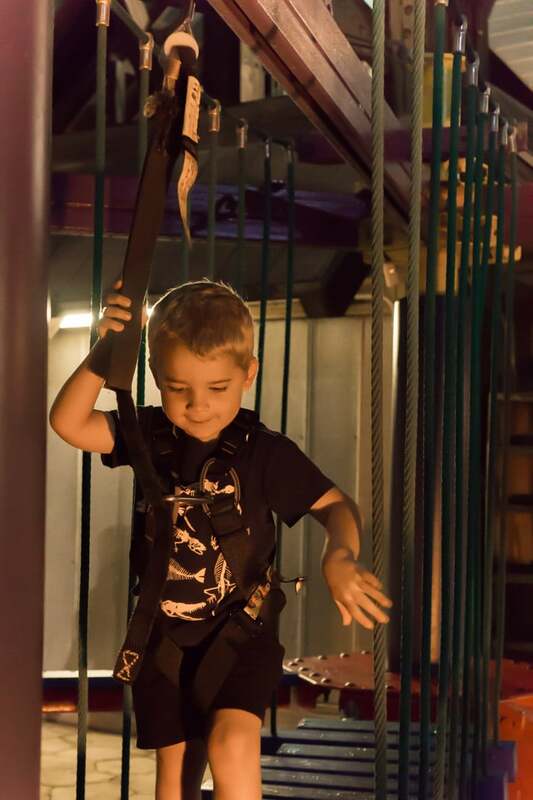 And if you want to spend money on some fun family activities, there are plenty of ways to do that with water sports like paddle boarding, kayaking, and more. Ask for availability and pricing at the beach activities hut on your way down to the beach! 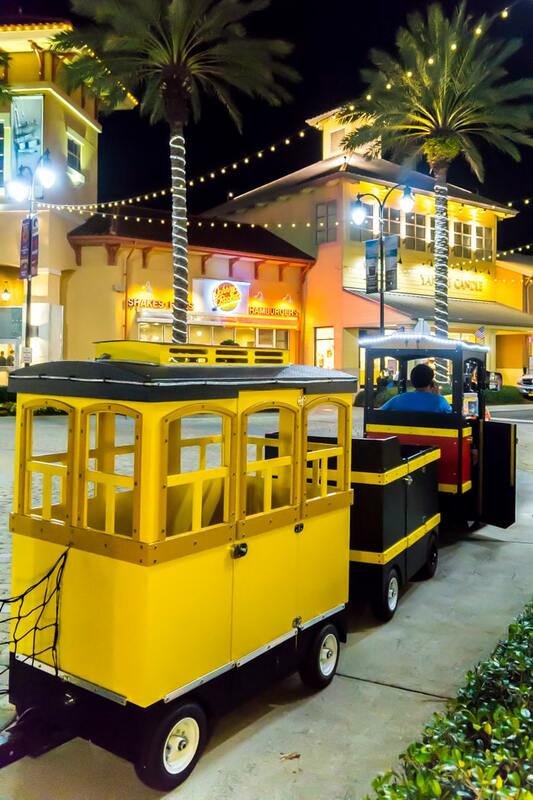 Make time in your schedule to hop on the free five-minute shuttle from the Hilton Sandestin Beach Resort over to the Village Baytowne Wharf. 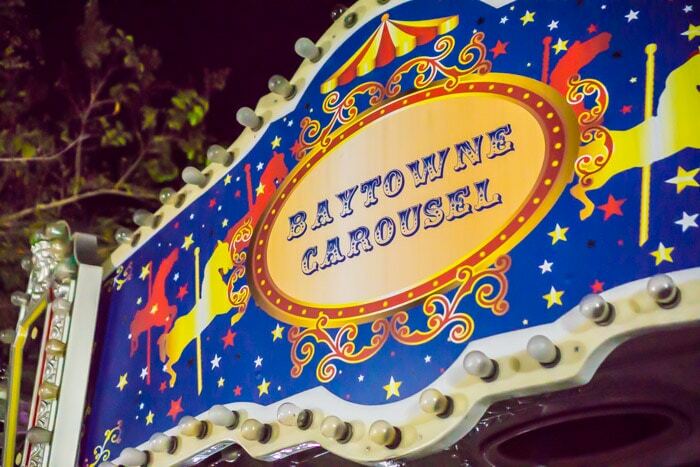 The shuttle runs throughout the day, throughout the year, and will drop you off amid family-friendly activities, restaurants, and entertainment just a few minutes away. 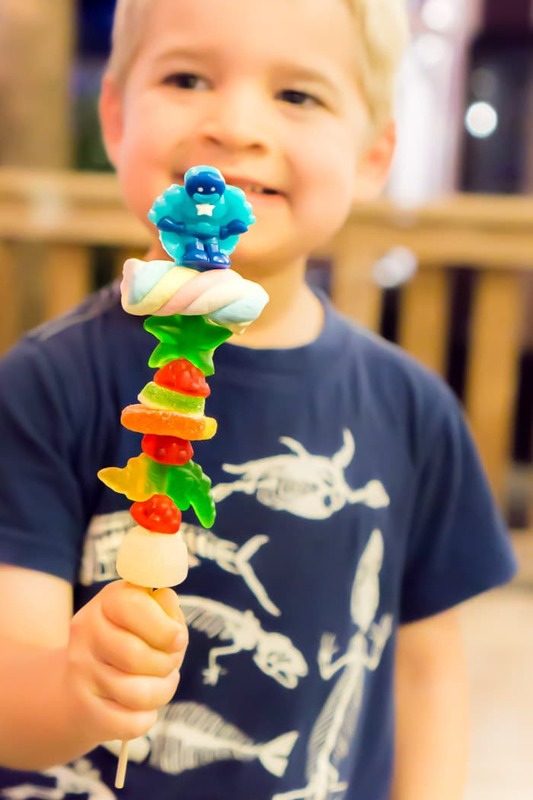 During our two hours at the Village Baytowne Wharf, we found a carousel with cars in addition to horses, my son did his first ever ropes course, we fed fish, we ate delicious pizza, and we found a cute old-fashioned candy store with a superhero + dinosaur candy kebab my son decided was made for him. And that was just in the two hours before the everything shut down. When we go back, we’ll make sure to head over during the day instead of just at night when all of the other activities are closed. 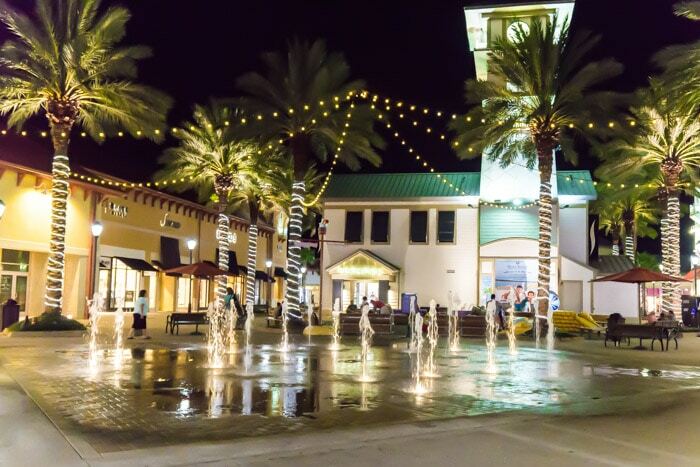 If you’re on vacation for long enough, jump in your car and drive to Destin Commons, an outdoor shopping mall about 15 minutes from the Hilton Sandestin Beach Resort. 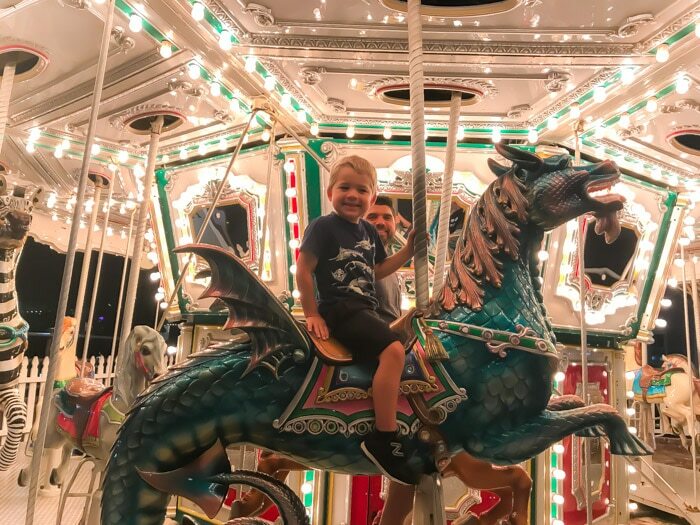 There’s a splash pad area, a playground, a train, a movie theater, and plenty of shopping and entertainment to keep the entire family entertained. 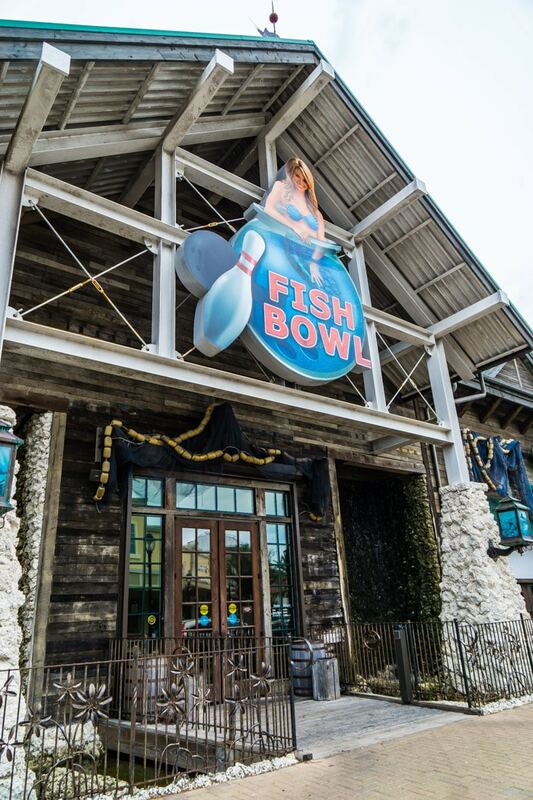 There’s even a Bass Pro Shop owned bowling alley called Fish Bowl that is ocean themed. 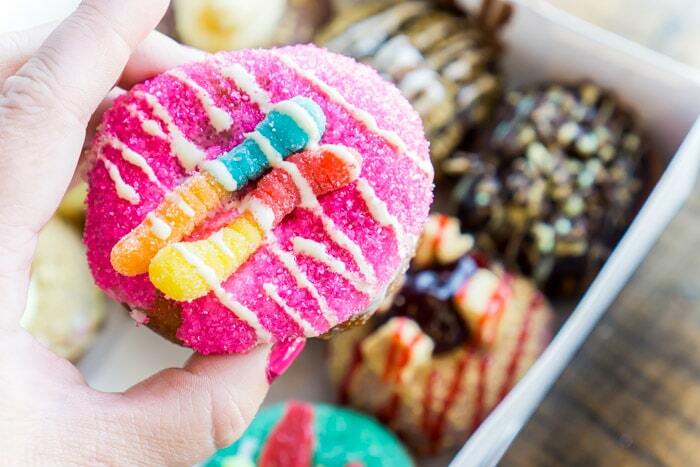 While you’re there, make sure to take a short five minute detour and visit Destination Little Donuts, a custom gourmet donut shop serving up delicious little mini donuts in way too many flavors to count. 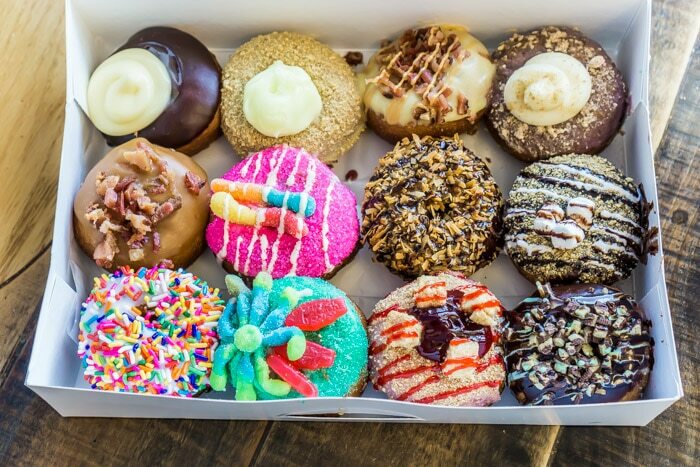 We ordered 12 and enjoyed all of them, but my son was the clear winner with his sprinkles + gummy worm donut. Definitely worth a trip! 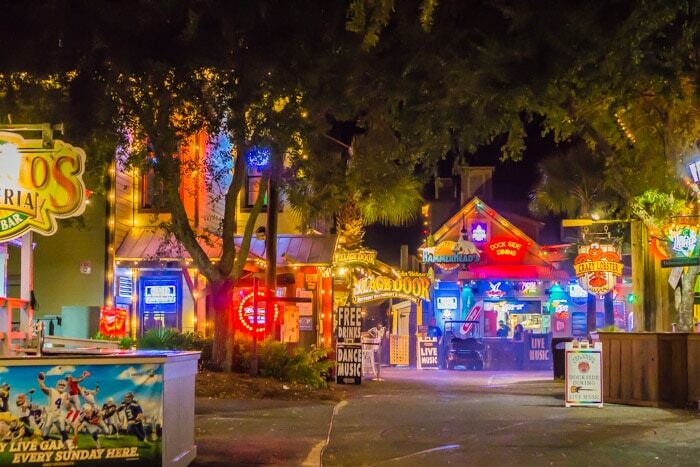 I mentioned the Village Baytowne Wharf and Destin Commons just in case you want to leave the resort, but in all honesty, you could never leave the resort and have a fantastic family vacation. 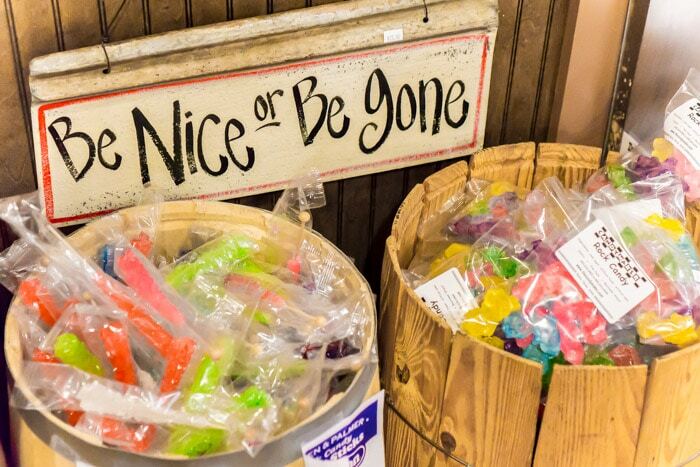 There’s food, a spa, a little convenience store/gift shop, and a beach – what else could you really need? 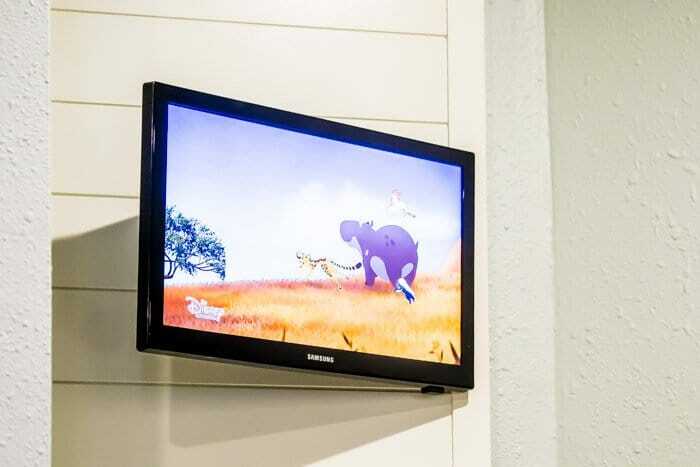 When you have young kids, it’s ideal to be able to have everything that you need in one place. The best places are the ones where you can leave if you want, not because you have to. 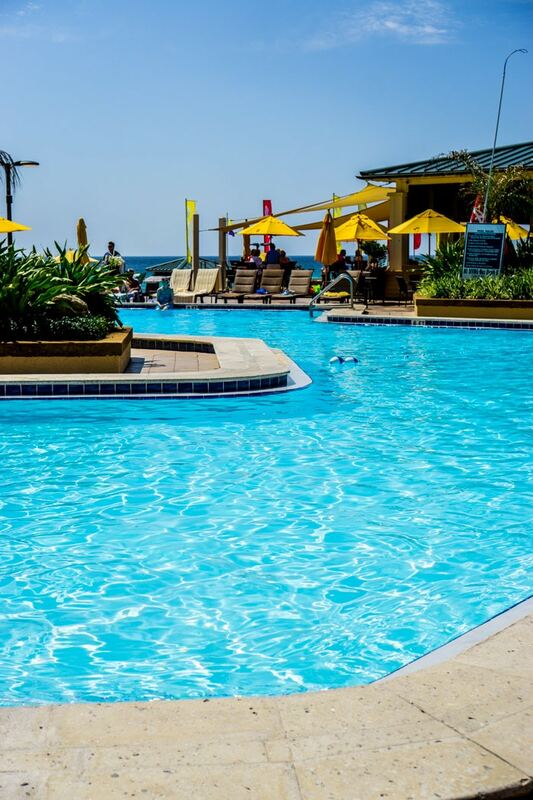 Don’t forget to pin this guide to the Hilton Sandestin for later!